The Boxing Truth®: Should Golovkin Fight Jacobs Next? For undefeated unified WBA/IBO/IBF/WBC Middleweight world champion Gennady Golovkin and top WBA Middleweight contender Daniel Jacobs, a potential fight between the two is one that should be considered a fight fan’ s fight. Not only would an encounter between two pit two exciting fighters against one another, but it would also be a battle between two of the division’s knockout artists. Before an encounter between Golovkin and Jacobs could be discussed however, both fighters stepped into the ring on September 9th and 10th respectfully to do battle against other opposition. For Jacobs, his fight would come in the form of a rematch against former WBC Jr. Middleweight world champion Sergio Mora on September 9th at the Santander Arena in Redding, PA. The first encounter between the two was best described as this observer stated before the rematch as “Inconclusive.” This was due to Mora suffering a fractured right ankle which caused the fight to be stopped in the second round. In previewing this fight, I closed my comments by saying that it was my hope for both the fighters themselves as well as Boxing fans that the rematch would have a “Conclusive” outcome. Unlike the first fight where both fighters suffered knockdowns and left an element of uncertainty as to what may have happened if Mora did not suffer the ankle injury, Jacobs would dominate the rematch consistently forcing the action and knocking Mora down five times before the bout was stopped in the seventh round. Jacobs seemed to be the stronger of the two fighters from the outset and never really let Mora get into a position where he could get comfortable or dictate how the fight was fought. Although Mora attempted to use lateral movement to try and evade Jacobs’ offense and was successful in occasionally landing counter punches, Jacobs had an answer for everything that Mora tried and the second encounter between the two was one-sided. Jacobs, who has held interim/regular champion status in the WBA’s Middleweight ratings for over two years clearly showed in this fight that he is ready for an opportunity to face the champion. What made this noteworthy was that if Golovkin were to lose the fight against Brook, it would likely have meant that Daniel Jacobs per his holding interim/regular champion status and his knockout victory over Sergio Mora the day before could have been named WBA world champion if Brook was successful in scoring an upset to take the rest of Golovkin’s unified world championship away from a man that has earned his position as the number one fighter in the division. Although the element of the politics of the sport were present prior to this fight, the fight itself did have the look on paper of an intriguing battle as it was the first time in twenty-six years that a reigning Welterweight world champion moved up thirteen pounds in weight in an attempt to win a Middleweight world championship. This fight also presented an interesting scenario of a boxer/puncher against a knockout artist. What surprised me about this fight was Brook’s willingness to engage with Golovkin from the outset rather than using his movement to be defensive early on. What was impressive about Brook’s performance particularly in the early rounds was how he stayed within range of Golovkin, but used his hand speed to offset the champion’s pressure even though Golovkin was able to back him up. Brook won rounds two and three based largely on his ability to outwork Golovkin and make the champion miss, in the opinion of this observer. Although Golovkin was seen as a significant favorite going into this fight, an argument could and should be made that Kell Brook was the first fighter to provide the champion with a significant test as this was the first fight where Golovkin seemed to clearly lose rounds, something that had not been said in Golovkin’s career before this fight. Brook’s combination punching also nullified the champion’s offensive output for a period of time over the course of this bout. After four rounds, I had Brook winning three of four rounds. It appeared that Golovkin was having some trouble with not only Brook’s hand speed, but his style overall as this was the first time in my recollection that Golovkin was made to miss much of his offense and be put into position where he was being outworked. The champion however, was able to have his moments throughout the first four rounds. Even though Golovkin was able to cause significant swelling to Brook’s right eye early in this fight, it should not be overlooked that Brook was also able to mark up Golovkin’s face as well, which is something that not many previous Golovkin opponents have been able to do. The swelling to Brook’s right eye however, would prove to be the story of the ending of this fight. In a scenario that was not unlike some previous moments earlier in the bout where Golovkin was able to put Brook on the defensive by landing a flurry of punches, Brook was stunned by an attack from Golovkin to the body and head in the fifth round which prompted Brook’s trainer Dominic Ingle to throw in the towel and stop the fight. Although I felt initially that Ingle’s decision to stop the fight was peculiar particularly because of how well his fighter was doing throughout the whole fight, it was revealed after the fight that the swelling to Brook’s right eye, which was caused by a Golovkin left hook in the first round and gradually got worse as the fight progressed was diagnosed as a broken eye socket. Even though some may call the stoppage controversial, it is important to remember that Kell Brook is a fighter who has not only a world championship in the Welterweight division, but more importantly a fighter who could have a long career ahead of him. Despite my initial opinion that the fight was stopped quickly, I applaud the decision of Dominic Ingle to put the long-term well-being of his fighter as the top priority over the potential of making history as possibly being able to win a Middleweight world championship while also holding a Welterweight world championship. The safety of fighters should always take top priority over world championships and any lucrative opportunities that may come along with those accolades. It had to nevertheless be a difficult decision to make by a trainer who’s fighter was clearly in the fight and not being dominated by one of the most feared knockout artists in the sport. For Golovkin, the victory over Brook was his seventeenth successful championship defense and his twenty-third consecutive knockout victory. Even though this was not a fight that was as dramatic as some of the champion’s previous title defenses in terms of Golovkin’s ability to bring it to its conclusion, he still got the job done and sometimes that is all a fighter can do. It may be true that this was not one of Golovkin’s more devastating performances, but not every fight is going to end the same way and it goes without saying that some fighters will provide more of a challenge than others based on skill level, style, and ability. Even the most dominant of champions throughout the entire history of Boxing have had their share of tough fights at one time or another throughout their careers. This fight should be viewed as the first significant test of Golovkin’s career and it will be interesting to see what he can take from this fight and use to his benefit in the future. As the champion now sits three successful title defenses away from tying the all-time Middleweight record for successful world championship defenses, which is currently held by Bernard Hopkins, it will be interesting to see what happens next. Of course, there will be those who will continue to fuel demand for Golovkin to face former two-division world champion Saul Alvarez in what is a highly anticipated fight. It is the opinion of this observer however, that Golovkin should consider making a mandatory title defense against the WBA’s number one contender Daniel Jacobs in his next fight. For their part, the WBA announced earlier this week that it has mandated that a fight between the two take place within 120 days. Although this observer has been critical over the years of the WBA for its designation of “interim/regular champions”, I applaud their decision to mandate a mandatory title defense between Golovkin and their top contender. Even though the organization’s designation of what this observer refers to as “interim/regular champion status” for their number one contenders throughout all divisions is one that is well-intentioned particularly in regard to the potential of world champions either getting hurt or simply not fulfilling their obligations to meet a mandatory number one contender, there has been a history where fighters who hold such status in a weight class have had to wait a significant period of time even as long as a few years while facing other opposition to maintain their status before getting the opportunity to face the WBA world champion. Daniel Jacobs has waited over two years and has defeated all opposition that has been placed before him during that time. Although some may view a fight between Golovkin and Saul Alvarez, a fighter who has chosen to face Jr. Middleweight world champion Liam Smith in a fight that will take place this weekend instead of Golovkin, why should Golovkin wait on a fighter who has other obligations and perhaps other interests when he has an opponent who is more than willing to take him on and has earned the opportunity to fight him? 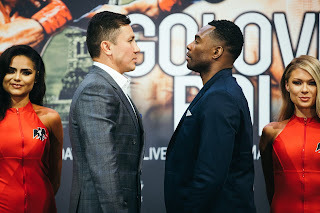 Even though Golovkin will likely wait for the result of this weekend’s Smith-Alvarez showdown before making any decisions, this observer believes the best case scenario that would satisfy not only Boxing fans, but also ensure that mandatory obligations are met is for Golovkin to make what will be his eighteenth title defense against Daniel Jacobs and for the winner of that fight to face the winner of Smith-Alvarez. Whether or not the scenario plays out remains to be seen, but it is best for fights to be made when there is significant public interest rather than making those who support the sport in good times and bad, the Boxing fans wait a long period of time before a marquee or “Super Fight” finally takes place. It is a formula that has not always worked out to the benefit fighters, but more importantly the sport. Hopefully, Boxing fans will not have to wait much longer before a fight they have demanded becomes a reality. If Alvarez defeats Smith and Golovkin fights and defeats Jacobs, why make Boxing fans wait any longer?